Was able to try this on over the weekend. 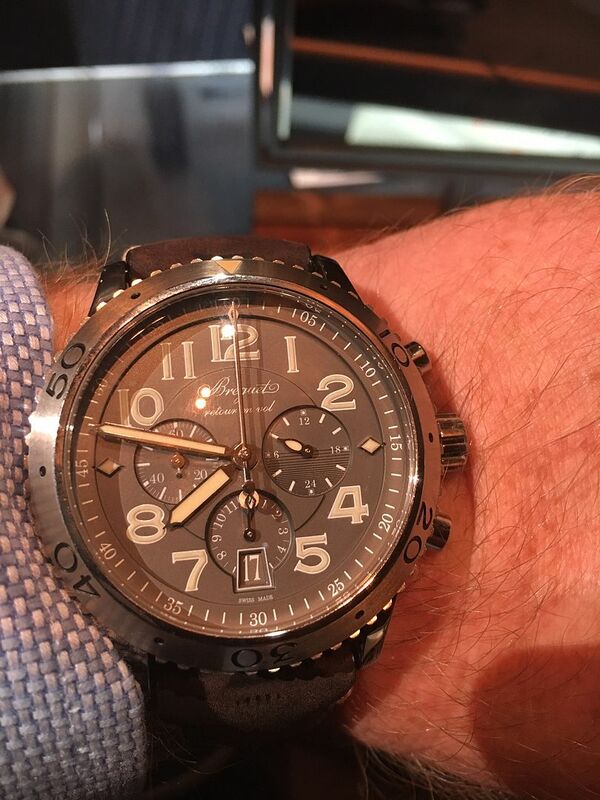 Dial slate grey, signed Breguet. Hours chapter with luminescent Arabic numerals. Day/night indicator at 3 o'clock. 12-hour totalizer and date at 6 o'clock. Small seconds at 9 o'clock. Central minute totalizer. Luminescent hands and dots. Self-winding chronograph movement, with "flyback" function. Numbered and signed Breguet. Cal. 584Q/2. 131/2 lignes, 26 jewels. 48 hours power reserve. Inverted in-line Swiss lever escapement with silicon pallets. Silicon balance-spring. Balance frequency 4Hz. Adjusted in 6 positions. OK, marketing aside, this is a really sweet watch! I didn't get a shot of the display back, but it's very nice. Yes, it's supposed to be a tool watch, so why the display back, but it looks amazing (and the silicon components take care of the magnetism issues). Next Topic: Strap question for 3800.